Here is the one I did too late yesterday to photograph. I did this one for a sketch challenge at Lil Scrappers. We were to use at least three different papers, numbers and a quote as well as the sketch. Since I love using quotes on my layouts, that part wasn't to hard, but using the numbers was a different story. I rarely ever use numbers and I am still not sure about these. Other than that I am quite happy with the layout. I had one major interruption today though. While I was receiving some file transfers from Janet suddenly the power went off. Everything went dark and at first I thought "oh no, not my new computer", but then I realized that it was the entire street was out as the store was dark as well and Sophia was locking up. A few minutes later it was easy to see why.. I looked out my window and instead of seeing the store, this is all I could see. Say a prayer for me tonight please, I am attempting to return to work again tomorrow. I pray that things go right this time. Good luck at work today Jackie. I am sending positive happy and strong thoughts your way. Take care with this crazy cold weather! God Bless you at your job on Wednesday. May He give you focus and concentration and peace and joy while you go about your work. I LOVE those new layouts! 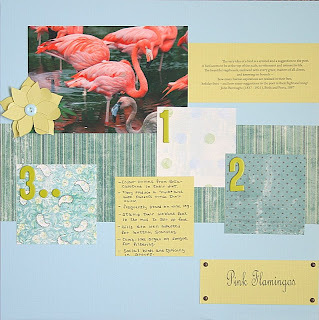 The Pink Flamingo layout is sweet. 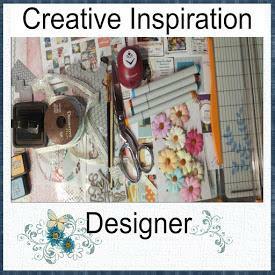 I like the different papers you used and I really like the paper flower with the button center! I love how you used blue as the main colour for this layout, too. It makes the pink of the flamingos more striking and beautiful. 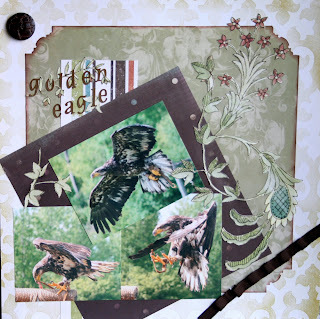 Of these two layouts, I think the Golden Eagle is my favourite. Probably just as much because I think that the Golden Eagle is such a magnificant bird as your amazing layout OF the bird. You took some GREAT action shots of him! I LOVE that one of him coming in for a landing on the perch. Absolutely amazing shot! The colours you chose work really well and the ribbon at the bottom right corner is great! Is it looped? How did you do that? Hey,i see yr kiddo posting here.how cool!gee! Prayers being said for you jackie. and i hope u receive my comments everytime i post them cox sometimes they come back to me in my email saying "error". Was looking at the pics before finishing the post and could not figure for the life of me,what you were seeing..lol.. a House!! Best to you at your job. Love your upswing lo...just beautiful! !